1. 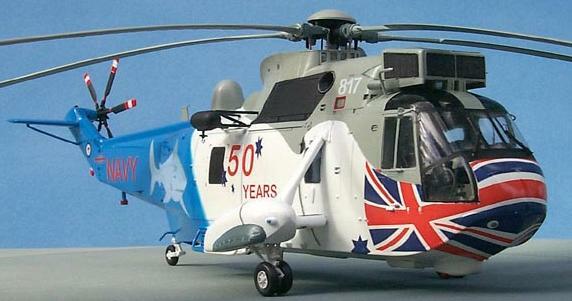 Revell's 1:72 Westland Sea King HAS.6/AEW.2 #4450 is now available. 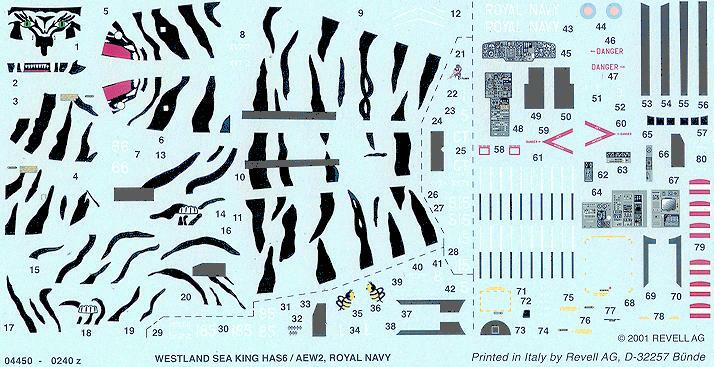 You get all the parts from the Sea King Mk.41 kit #4427, plus two additional sprues. The fuselage mouldings and cabin floor are identical with the previous version except that Revell have added some additional locations on the inside, to be drilled through depending on the version chosen. Some of the surface detail has to be removed, such as the chaff dispensers on the fuselage and various items on the cabin floor, though the instructions are not very clear on this. There is still no requirement to open up any of the windows whose outlines are moulded on the inside of the fuselage, leaving the probability of more versions to come. The instructions have an uncharacteristically hurried and amateurish feel - for example the way the sixth tail-rotor blade has been added to the drawings. A number of parts from the original sprues are not used, mostly aerials, antennae, etc, plus the 5-bladed tail-rotor. You'll also be left with some spare seats and the nose radome. The larger of the two new sprues carries the 6-bladed tail-rotor, dorsal radome, fuselage strake, a new operator station, starboard MAD sponson, nose, engine filters, troop seats, dunking sonar, blanking pieces for two windows (only one of which is used), and of course a new array of aerials, antennae & sensors. All the instrument panels carry a wealth of moulded detail which will have to be removed if you wish to use the excellent decals that are supplied as an alternative (no mention of this process in the instructions). 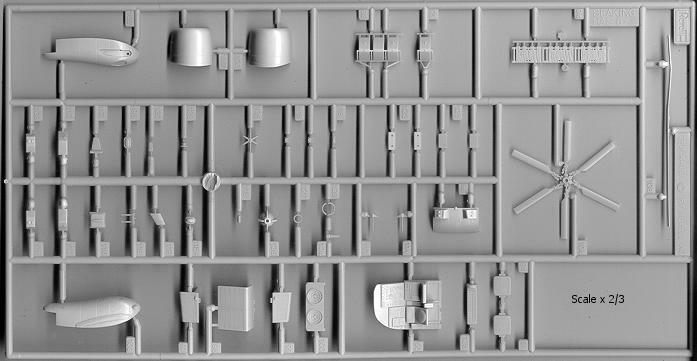 The smaller of the new sprues, which appears to be just part of a larger moulding, carries the additional parts for the AEW.2; the Searchwater radome, its support arm, the nicely detailed control structure that sits inside the cabin door, and the cabin door itself - there's no way you're going to choose to attach this in the closed position. All these options are painted Medium Sea Grey BS381C/637, which Revell try to achieve through one of their usual mixtures. This colour is however available in the Xtracolor range - #X003. The 814 Tiger Squadron HAS.6 is greatly enlivened by the tiger markings provided in the form of black decal stripes to be applied over a painted yellow background. Two other alternative sets of 814 NAS HAS.6 tiger markings are currently available, the more restrained scheme for XV539/'68' on Model Art sheet 72/035, and the 'Flying Tigers' scheme for ZG818 in the Fujimi kit #35124. The essential reference for this excellent kit is the Wings and Wheels publication 'Westland Sea King in detail', which includes pictures of both XV712 and XV539 in their tiger markings, as well as a collection of interior detail shots. Airwaves provide an alternative resin Search Water radome in its deflated configuration, #S72-046. 2. Navigator from Nizhny Novgorod have launched a 1:35 resin Mi-24 Hind kit. Unlike their more basic Mi-8, this model comes with decals and a detailed cockpit. Unfortunately there are no clear parts, though the canopy frames are provided. If you want this kit, expect to pay around US$90 for it. 3. Polygon have published a softback book on 40 years of the Mi-8 Hip. The text is all in Russian, but it does contain some very nice and hitherto unpublished photographs of Mi-8s. The book is recommended by Linden Hill. The last two will be very similar since the XR-3 was simply a jump take-off modification of the YG-1 with a re-designed rotorhead incorporating cyclic & pitch control. 5. LF's partner, Kora, has released 1:48 (#4803) and 1:72 (#7244) kits of a Yugoslavian experimental V-STOL tilt-wing prototype called the Aerostatoplan Zchuchenko. These are resin and photo-etched metal. The 1:48 kit would appear to be more detailed since it contains more parts. 6. 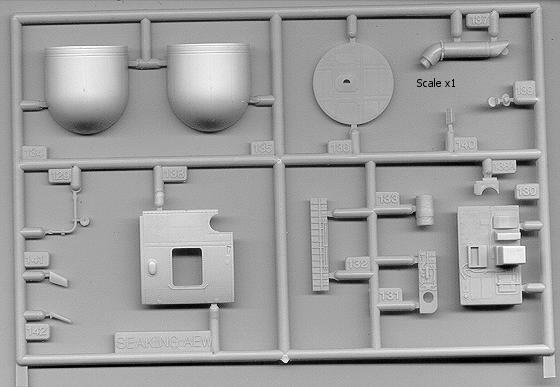 Sanger Engineering's new 1:72 vacform and white metal Mil Mi-6 'Hook' is now being offered for sale by Hannants, kit #7219. 1:48 SH-60B/F conversion for the Academy Blackhawk kit. Other supposed releases from Cam in the past have never appeared, so the status of these has to be questionable. 9. The manuscript for Lennart Lundh's history of the Sikorsky S-62/HH-52A will finally go to Schiffer at the end of this month. It's turned into a much bigger project than he ever imagined, with a final result that has 50% more text and a third more photos than his work for the same publisher on the H-34. It'll actually be in print sometime next summer. As Len says, "we're in an age when some publishers are known to refuse books because "there aren't enough kits", and some manufacturers reportedly reject kit ideas because there aren't enough references. This might be a good time for those who want to see a kit of the Seaguard to start telling the makers. 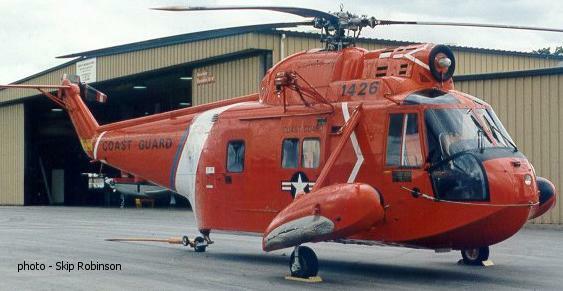 While it isn't the most famous of helos, there were three major variants, use by the services of four countries (plus some airlines and a whole bunch of lift companies), and a lot of colorful paint jobs." 10. Unicraft have revised and re-issued their 1:72 Yakovlev Yak-EG co-axial helicopter, so if you order now you'll get fresh new mouldings. "The box-art shows two Longbows flying over some Soviet armor on the battlefield. The Apaches are equipped with Hellfire missiles, 2.75" rocket pods and Aim-9L Sidewinders, however the kit does not contain any AiM-9L's. You get 5 sprues molded in light gray plastic, one sprue in clear plastic, one sprue of real black rubber, one decal sheet composed of generic AH-64D stencilling, one 8-page instruction sheet, and one packet containing plastic cement and a pair of small tweezers. The basic structure of the components is very similar to the 1:48th Monogram and 1:32 Revell Apaches except that the avionics sponsons are separate and wider than the previous kits. The mast mounted radome comes in a top and bottom half and has a completely different rotor hub. The Hellfire missiles are the "L" variant with extended noses and include clear plastic for the seeker heads. The ALQ-144 Pulsed IRCM "hot brick" is moulded in grey plastic not clear and comes in two halves. The wingtip ordinance is two Stinger missiles per wing. You also get two rocket pods and detailed pylons. The 30mm chain gun has 7 parts and looks pretty accurate. There is also a Flare/chaff dispenser. The clear canopy is molded in one piece and includes the clear cockpit divider, also on the clear sprue are the strobe/IR formation lights, landing lights, PNVS lens, TADS turret lenses, and HUD lens. The cockpit looks like an "A" model cockpit. It does not have the glass displays that the "D" model should have. The seats are separate from the tub, have the seatbelts molded on them, and do include the armor side protection. The T-700 engine fairings are molded in a top and bottom half so modellers building this kit will have to do some extra work to get the seams out of the engine exhausts. The square mesh or "Black Hole" heat diffusers on the exhausts are molded in and look OK. The gear struts are molded completely separate from the avionics sponsons. They are very sturdy. The wheel hubs are molded in gray plastic and the tires are made of real rubber, molded in black, and have a realistic tread pattern. The tail wheel is also molded in real rubber. There are no open engine hatches or avionics hatches. There are no resin or etched brass parts. The decal sheet is just basic data stencilling. There are no specific markings for US Army units or any other nations." Thanks to Lennart Lundh, Drew Graham, Tony Morgan, Dave Mason, Petr Zaoral, & Gary Madgwick (Model Alliance).